These spoons were dug up by my friend Ed Provine who along with a gang of diggers dug large numbers of old privets, cysterns, and wells in the downtown area of Memphis when urban renewal removed hundreds of homes during the 1970’s. 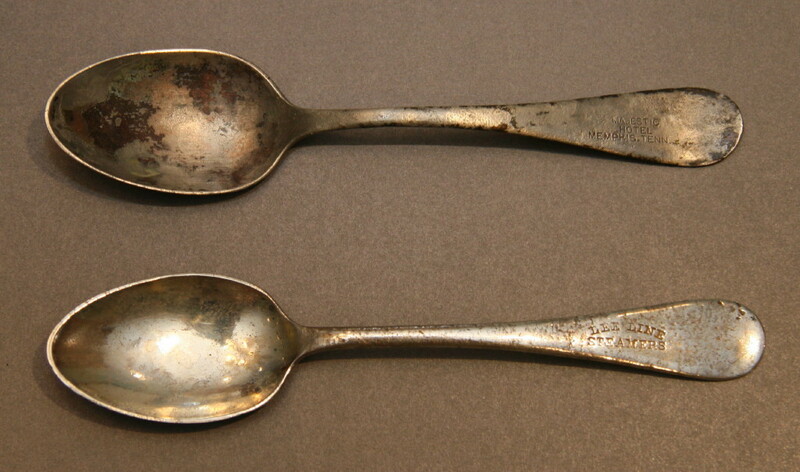 The Lee Line spoon was found in a trash pit somewhere south of Beale Street. Ed and a friend dug this spoon along with an old jug. After a lenghty discussion on how to divide the findings, Ed left with the spoon which was badly bent and had no plating. Even with new plating, it is evident that the spoon was quite corroded. Ed has a much nicer Lee Line spoon in his personal collection. Likely, there are not many Lee Line utensils in existense since the Lee Line wharfboat burning in 1924. Additionally, these utensils were inexpensive copper plated utility items. Ed sold me the Lee Line spoon and gave me the Majestic Hotel spoon. My great uncle G. Peters Lee bought the Majestic Hotel in 1913 or 1914. Memphis City Directories from the period record that in addition to the Majestic Hotel, there was a Majestic Pool Hall and Majestic Bar which was forced to close in 1914 when Tennessee enacted Prohibition. Peters Lee renamed one of the Lee Line steamboats which he purchase at the voluntary liquidation of the Lee Line in 1926 the MAJESTIC and formed the Majestic Excursion Line. Hi there! I have a Majestic Hotel spoon that I found at a thrift store. I’m not planning on getting rid of it but are they worth anything? Melissa, thank you for letting me know you found a Majestic Hotel spoon. thrift store? Could you send me a jpg of the spoon? Thank you.